The National Precast Concrete Association takes quality control and validation to the next level with a new product-focused certification for water and wastewater tanks. 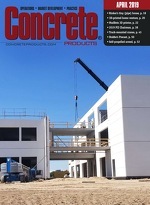 While its Plant Certification program has traditionally centered on precast concrete production processes candidate operations must abide, the just-launched Optional Product Listing for Water and Wastewater Tanks Program describes specific product models, plus design and performance criteria to obtain certification. Like other association programs, the new offering enlists independent third-party engineering firms accredited to ISO/IEC 17020:2012 for Plant Inspection. Just as Plant Certification enables quality-conscious agencies, engineers and specifiers to identify and select premier precast concrete producers, NPCA notes, the Product Listing Program takes certification one step farther to include specific water or wastewater tank models. Plants displaying the NPCA Certified Plant and NPCA Listed Product markings on their tanks underscore processes complying with industry, design and performance standards. The certification and listing programs reflect NPCA’s commitment to assisting members with maintaining excellence in precast production and operations. By setting one standard of quality, they level the playing field for all producers pursuing market segments or individual contracts. Additional information on Plant Certification and Listed Products can be obtained from NPCA Director of Certification and Regulator Services Richard Kolewski, 800/366-7731.